Best Gift: Ideal choice for new mom and dad to go shopping, travel, go for a walk or picnic. you can take in the milk bottle, water bottle, baby clothes, baby diaper, towel so on in different separate pockets. Quality Guaranteed: Crafted from waterproof durable 300D nylon, easy cleaning when backpack is dirtied by water and milk. Smooth and durable metal zippers give you quick and easy access to the bottom of the diaper bag. Material: High quality Oxford fabric. dimensions: 13.3" x 15.3" x 6.6". The shoulder strap is adjustable. Easily attach to most stroller. Color: Red, Blue, Pink, Navy blue. For any possible defective products, please contact us first, we will offer you a replacement or refund you. caring about our clients is the number one priority for us. 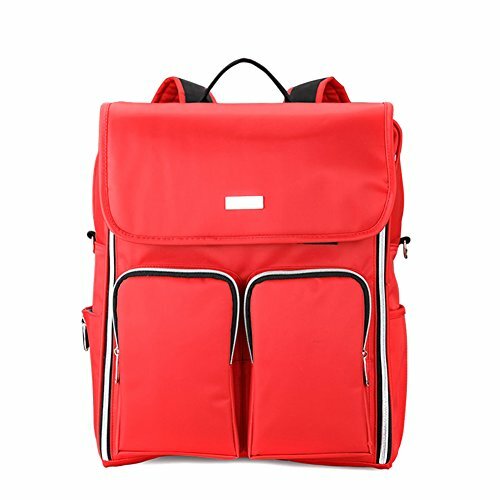 LARGE CAPACITY & COMPARTMENTS: This diaper bags can take in the milk bottle,water bottle, baby clothes, baby diaper,towel so on in different separate pockets.Size(L x H x W): 13.3"*15.3"*6.6"(about 34*39*17 cm).Weight is about 4.1LB. Duarable Materials: Easyhui baby bag always use the material of the best quality -durable water resistant Environmental Oxford Fabric and easy to wipe clean, don't afraid the milk/water spill on the bag when feeding the baby. Mulifunctional: You can use this bag as backpack and handbag. It is very elegant and suitable for many occasion like shopping, restaurant, traveling etc. Wherever,whoever,however,there will need a can be trusted backpack which can make your life much more easier. Waterproof Pockets: Made with high quality fabric that is durable and waterproof, with special plastic bottom protection, which makes you easy to wipe clean. Customer Service: Our backpack dedicated to provide 100% quality products for mothers and kid. 30 day money back guarantee, any problems with your bag, please contact us, we will get back to you within 24 hours. If you have any questions about this product by EasyHui, contact us by completing and submitting the form below. If you are looking for a specif part number, please include it with your message.